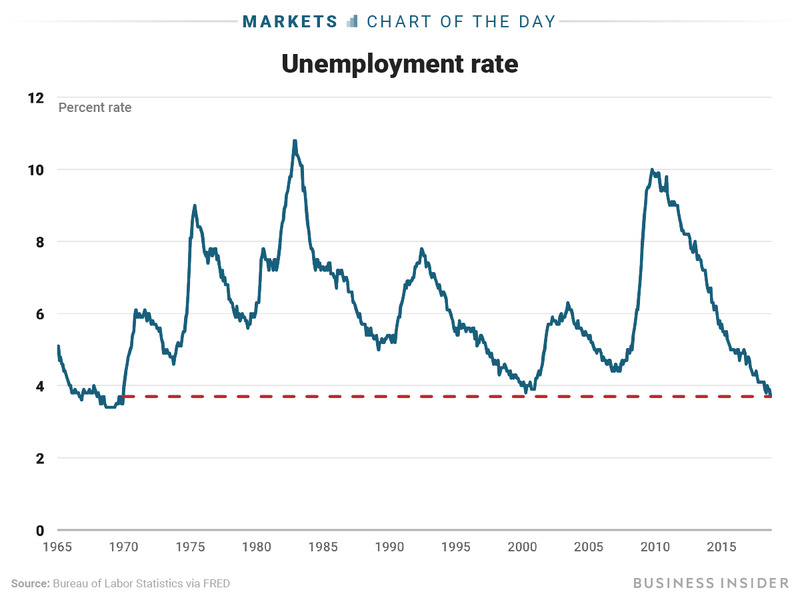 According to the monthly jobs report from the Bureau of Labour Statistics released Friday, the unemployment rate in September fell to 3.7%, its lowest level since December 1969, when Richard Nixon was president. Nonfarm payrolls increased by 134,000, fewer than expected and slowed in part by job losses attributed to Hurricane Florence. Nearly 300,000 workers told the BLS that bad weather kept them away from their jobs, most likely in industries like hospitality in which they’re paid only if they show up. 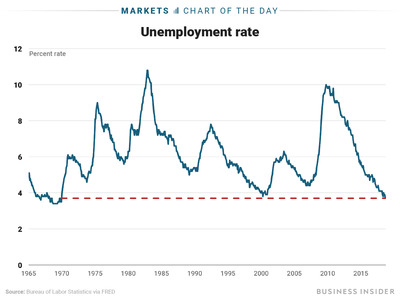 “Given the fact that the job market has been so strong for so long, there is an expectation that labour will begin to take more of the capital from corporate profits going forward,” said Michael Arone, the chief investment strategist for the US SPDR business at State Street Global Advisors. Earlier this week, Amazon announced that it was raising its minimum wage to $US15 an hour, more than twice the federal mandate of $US7.25. That was not expected to move the needle on last month’s wage number but served as a key anecdote on the pressure companies were under – politically and from a tight labour market – to raise wages. Investors were also watching wage growth closely amid a sell-off in the bond market. Bond yields rise when prices fall, and they spiked Wednesday to their highest level in over seven years after a strong private-payroll report from ADP and bullish comments from the Federal Reserve’s chairman, Jerome Powell.